I mis-spelt it, but The Valeyard. Darren wrote: I mis-spelt it, but The Valeyard. Right, so if I understand it correctly, this Valeyard character is supposed to be made up of all the iffy bits of all the Doctor's incarnations but is genetically identical to the Doctor and is supposed to appear between his 12 and 13th incarnations, which meant that he should have popped into existence between Smith and Capaldi? Doesn't that make the Valeyard the 13th Doctor, which means that Capaldi is therefore the 14th? And why doesn't The War Doctor count!?!?! My brain hurts . . .
Pat wrote: Where are we up to with the regenerations anyway? I get confused with where the War Doctor comes in to the regeneration timeline and does the Doctor have a new limit now or can he(she) just keep regenerating indefinitely? Grace Speaker wrote: , part of him ended up in Donna . . .
Well if he has two hearts, maybe he has a spare one of those as well . . .
Grace Speaker wrote: Where are we up to with the regenerations anyway? I get confused with where the War Doctor comes in to the regeneration timeline and does the Doctor have a new limit now or can he(she) just keep regenerating indefinitely? Eh? Are you making stuff up? Did the significant owl hoot in the night before he was allowed to don the Sash of Rassilon in the room with the Eye of Harmony? I hope the Four Watchtowers were duly secured and the Trouser of Sanctity was suitably shrived beforehand . . .
Grace Speaker wrote: Did the significant owl hoot in the night before he was allowed to don the Sash of Rassilon in the room with the Eye of Harmony? I hope the Four Watchtowers were duly secured and the Trouser of Sanctity was suitably shrived beforehand . . .
OK, I've read the whole recap now and can summarise my thoughts thusly: There were far too many recreational drugs being taken in the 70's! Although in terms of origin myths, does anyone know if this Doctor Who storyline was the inspiration for The Matrix trilogy and the "Resistance is futile" catchphrase of the Borg in Star Trek? and the "Resistance is futile" catchphrase of the Borg in Star Trek? According to the Internet, the phrase "Resistance is useless" appeared earlier, in the 1964 Doctor Who episode "The Daleks" and the exact phrase "Resistance is futile" appeared in Space: 1999 in 1978 - same year as HHGTTG was firstr broadcast. Pat wrote: According to the Internet, the phrase "Resistance is useless" appeared earlier, in the 1964 Doctor Who episode "The Daleks" and the exact phrase "Resistance is futile" appeared in Space: 1999 in 1978 - same year as HHGTTG was firstr broadcast. Well played, Dr Harkin, well played! The geek in me says they got the top of the T wrong (ignoring the upright part off it being off position too). Darren wrote: The geek in me says they got the top of the T wrong (ignoring the upright part off it being off position too). 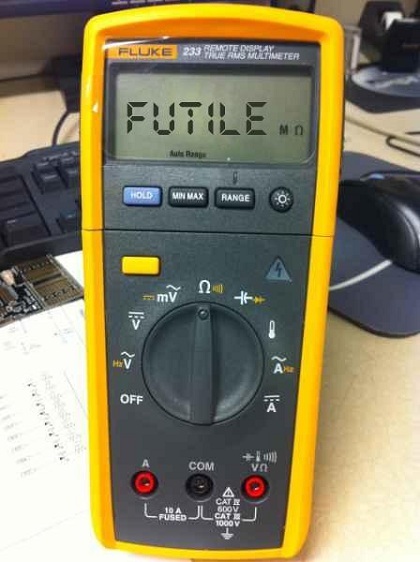 The geek in me says that's a neat trick with a 7 segment display, because thats all the Fluke 233 has. It DOES have a very cool remotable screen though, so you can set up a measurement in a horrifically hot but isolated test, close the cabinet, and measure the result from outside.